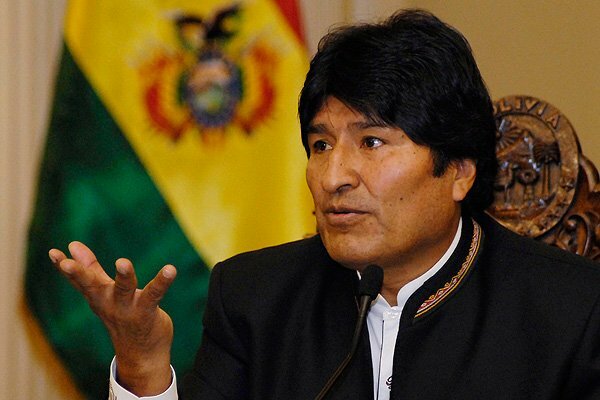 Evo Morales, the President of Bolivia’s multinational state, has praised the Islamic Republic of Iran’s fight against the US hegemony, expressing his country’s support for Tehran in international issues. In a Monday meeting with Iranian Deputy Foreign Minister Morteza Sarmadi in Bolivia, Morales said he and his Iranian counterpart have common views and stances on many issues. He lauded the Islamic Republic for its fight against the US’ hegemony and expressed his country’s support for Iran on various political and international issues. “As the US has its own allies, the countries standing against the US’ hegemony in the world should also have their own bonds and links,” he said. During the meeting, the two sides also exchanged views on ways to enhance further bilateral relations. Morales called for further reciprocal visits by Iranian and Bolivian delegations to expand economic and trade ties between the two sides. The Iranian diplomat, for his part, handed over a letter by Iranian President Hassan Rouhani to Morales on the US’ illegal withdrawal from the Iran nuclear deal. Sarmadi then thanked the Bolivian president for his brave stances against the US’ exit from the JCPOA. He then underlined the multi-national nature of the Iran nuclear deal and called on the international community to stand firm against the US unilateralism. Sarmadi stressed that the JCPOA and the sanctions on Iran cannot go hand in hand. Elsewhere in his remarks, the Iranian deputy foreign minister cited a number of the US administration’s pretexts to leave the Iran nuclear deal as well as its violation of other multilateral and international treaties and said the US’ stance towards international accords amounts to a new dangerous heresy in the international system and a threat to the international peace and security. He also called on the world to adopt resolute measures to foil the destructive policies of the US.